AP EAMCET 2019 Notification: Andhra Pradesh EAMCET 2019 Notification, Exam Dates, online application form to be available at sche.ap.gov.in. Candidates can check AP EAMCET 2019 Important Dates For Paying Fees, Weightage, Courses Offering, Eligibility Criteria at official website. Download the AP EAMCET 2019 Official Notification PDF below. AP Eamcet 2019 weightage: Criteria for Ranking: As per G.O.Ms.No 73 of Higher Education(EC.2) Department, dated 28-07-2011, the candidates who have secured qualifying marks in AP EAMCET-2019 and candidates belonging to the category of Scheduled Caste and Schedule Tribe, for whom qualifying marks have not been prescribed, shall be assigned ranking in the order of merit on the basis of combined score obtained by giving 75% weightage to the marks secured in AP EAMCET-2019 and 25% weightage to the marks secured in the relevant group subjects namely Mathematics, Physics, Chemistry of the qualifying examination. AP EAMCET 2019 application should be submitted through ONLINE mode only. AP EAMCET Notification,Exam Dates,Hall Ticket 2019 Has Been Released.Candiadates How Are Seeking For AP EAMCET Can Download Here From Below Links. To download the hall ticket/admit card of AP EAMCET candidates will have to follow the procedure which is mentioned below. Candidates will have to click on the link which will be made available once the hall ticket is available to download. The next step is to enter the required details like payment reference ID, registration number, qualifying examination hall ticket number, mobile number and date of birth. Candidates have to download the AP EAMCET 2019 hall ticket and take a print out which has to be taken to the examination centre. In case any information reflected on the hall ticket is incorrect, candidates will have to coordinate with the officials to get it rectified before the commencement of the exam. Candidates must note that the hall ticket is an important document without which no candidate will be allowed to appear for the state level entrance examination. Candidates must ensure that all the details mentioned in the hall ticket of AP EAMCET are correctly mentioned. In case of errors, it is the responsibility of the candidate to get it rectified before the commencement of the exam. Along with the hall ticket, candidates will be required to carry AP EAMCET 2019 application form with duly affixed recent coloured photograph attested by Principal of College or Gazetted Officer (GO) and caste certificate (applicable to SC/ ST applicants). Candidates must carefully check the name and address of the exam centre mentioned in the hall ticket of AP EAMCET 2019 to avoid any stress in the last hour. Please ensure that the details printed in the Hall Ticket viz. Name, Date of Birth, Gender, Category and Stream are correct. In case of any discrepancy, get it to the notice of APEAMCET help line center through phone or mail(Preferable) immediately for necessary action. Hall ticket shall be shown at the Entrance of the Test Centre and also in the Examination Hall, failing which the candidates will not be allowed to write the test. Candidates will be permitted to appear for the examination only after their credentials are verified by the centre officials. Candidate will be permitted into the Examination Hall from 09:00 AM to 10:00 AM for FN Session and 01:30 PM to 02:30 PM for AN Session for capturing biometric information. Candidate will not be permitted into the Examination Hall once the test commences (i.e.10:00 AM for FN Session and 02:30 PM for AN Session) and will not be allowed to leave the Examination Hall till the END of the Examination (i.e.01:00 PM for FN Session and 05:30 PM for AN Session). Candidates will not be allowed into the examination hall even if they are late by one minute. Follow the instructions announced by the invigilator carefully. After loginin, go through the instructions displayed on the screen carefully and follow the list of symbols for answering online examination.No clarifications or doubts related to the questions of the examination paper will be entertained during the examination. If you face any hardware or software problems with the computer system provided, please inform the same to the Invigilators for rectifying the problem immediately. In case the problem is not rectified within reasonable time, you will be provided with another system. The time lost for changing the system will be compensated. The checkin procedure inside the Examination hall includes capturing of biometric information (your photo and left hand thumb impression). This is a security feature which will allow APEAMCET2018 authorities to verify your identity and also to check impersonation. Therefore, you are advised not to apply any external matters like Mehandi, Ink etc. on their Hands/Foot. Carrying of Calculators, Mathematical/ Log Tables, Pagers, Cell Phones, Watches (all types), Large Spectacles, any other Electronic Gadgets and loose sheets of paper into the examination hall is strictly prohibited. Candidate is permitted to write the Examination only once, though he/she has submitted multiple applications. The performance in the first appearance is only be considered, but for otherwise. Adoption of any kind of unfair means and any act of impersonation during the time of test will render the applicant liable for invalidation of his/her performance in the Examination. Further he/she will forfeit the claim of appearing for the test and will make him/her liable for criminal action. Complete the Filled in Online Application Form by affixing photograph duly attested by a Gazetted officer / Principal of the college where you have studied should be handed over to Invigilator after signing in the presence of Invigilator. Otherwise the candidate’s result will be withheld. There may not be a guaranteed security facility for safekeeping of your valuable devices or personal belongings outside the examination hall. Issue of Hall Ticket and appearance at the test does not automatically entitle the candidate for admission in to a College. No traveling expenses will be paid for the journey to take up the test. Blank papers will be provided for rough work in the examination hall. Candidates will not be allowed to leave the examination center without handing over the rough sheet to the invigilator concerned after the end of the examination. Contact the center chief Superintendent / Invigilator in the room for any technical assistance during the course of examination if required. Hall Ticket must be preserved till the time of admission into the college. Andhra Pradesh EAMCET 2019 Answer Keys Will be Available After Completion of Exam. Score and EAMCET Rank is important to get the seat in EAMCET Counselling 2019. So, Stay Tuned here for the AP EAMCET 2019 To Get Answers Keys. The board has taken decision to display answer key of AP EAMCET 2019 officially. The candidates who are eager to verify their answers and calculate the score can log in to the official website. They have to get the answers code wise. In the website two segments of AP EAMCET 2019 Engineering and Medical have been displayed. The official URL of the site is sche.ap.gov.in. All those candidates who have appeared in the AP EAMCET 2019 respective course paper. Meanwhile, if you are eager to check the answer sheets, you can check the unofficial solution sheets that will be prepared and issued by the some of the top EMACET coaching centers of the Andhra Pradesh. But, it is better for you to check the official AP EAMCET Answer Keys 2019 that will be issued by the conducting body soon in the official portal and analyse your performance in the exam. Soon, we will update the information here as soon as the availability of the AP EAMCET Answer Sheets for the year 2019. So, please be patient till then. Qualifying Marks For Ap Eamcet 2019: Pass Marks The qualifying percentage of marks for the AP EAMCET-2019 is 25% of the maximum marks considered for ranking. However, for candidates belonging to Scheduled Caste and Scheduled Tribe, no minimum qualifying mark is prescribed. But their admission will be limited to the extent of seats reserved for such categories (vide G.O.Ms. No. 179, LEN&TE, dated 16.06.1986). As per 25%, AP EAMCET Pass mark is 40 out of 160. 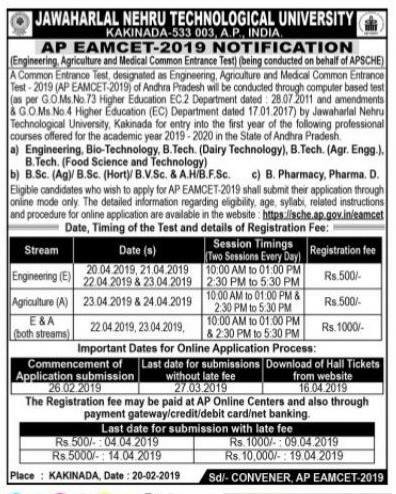 Don't Forget to Share This Collection Of AP EAMCET Notification,Exam Dates,Hall Ticket,Answer Key 2019, Further date will be intimated soon. Among All Your Friends, Colleagues & Also On All Of Your Social Media Pages So That Most Of Your Friends Can Get AP EAMCET Notification,Exam Dates,Hall Ticket,Answer Key 2019, Further date will be intimated soon.